A few weeks ago, I submitted a grant proposal, the first since starting my new job at the University of Edinburgh. This is how research works: You have a great idea for a project, but in order to do that project, you need co-workers and lab space and equipment. So you apply for a grant where you explain what you need the money for. Now, a while ago, this was relatively easy. 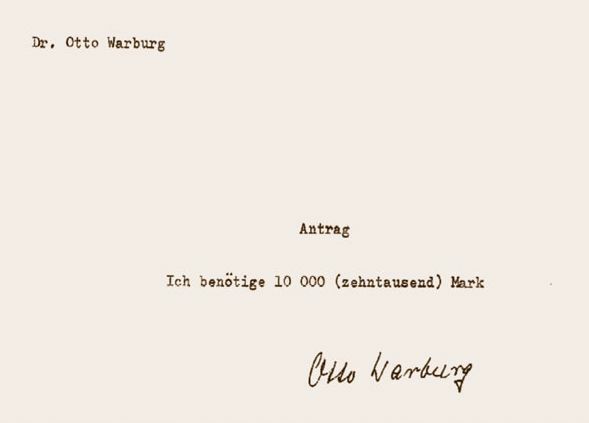 This is a facsimile of a grant application from Otto Warburg, ca. 1921 . Nowadays, of course, things are a bit more complicated. You have to explain what exactly it is you are planning to do, what work has done before, and what the expected outcomes of your work are. You have to put together a detailed budget, a time plan, a list of things and people you need. You need to provide evidence that you have thought about the ethics of your research, about how to disseminate your results, about what to do if the project does not go as planned, about how your university can support you in what you are doing, and many, many other things. In short, you have to jump through a few hoops (not literally, of course). Which is all fair enough, but it means that grant proposals are a lot of work. And then, the chances of success are often quite low. Many funding agencies or charities receive hundreds of grant applications for a given call, and can maybe fund a handful or so. So, in addition to a carefully crafted grant proposal, you also need to be lucky. No wonder, then, that I have heard applying for a grant compared to playing the lottery more than once. Of course, the odds are not quite the same, but it sometimes feels like no matter how much work we put in, the chances of success are so low that it is essentially a game of chance. The analogy goes even further than that: One PhD student I talked to made the rather interesting remark that if he won the actual lottery, he would probably give the money to the lab he was working in. Though maybe he’d make his supervisor jump through a few hoops first (literally, of course). Anyway, all this led to my colleague coming up with an interesting thought: Analogous to Ice-Cream Day when you submit (or publish) a paper, there should be Play the Lottery Day when you submit a grant. If G>L, you win (aka research funding is not so bad after all). If L>G, you lose. Think of a Plan B. Or maybe you don’t care, because you just won the lottery. This entry was posted in Uncategorized and tagged grants, life in the lab, research by melamelachan. Bookmark the permalink.